To rephrase a quote – “Ideas, ideas everywhere, but not an article written.” That came to light this week when I visited the new History Colorado Center. This totally interactive museum presented at least a few hundred ideas to explore for nonfiction articles. The editor of Handbook of Magazine Article Writing gathered prolific writers to contribute to this anthology of magazine writing. One suggested 2000 salable ideas in a year. Yet, if we kept our ears and eyes open, we could probably come up with many more – if only we had the time to research and write them. We draw ideas from our own backgrounds and experiences, but writer Michael J. Bugeja suggested we use our sensory perception to glean more ideas than we can possibly write. I’ll offer a few ideas from my museum visit. 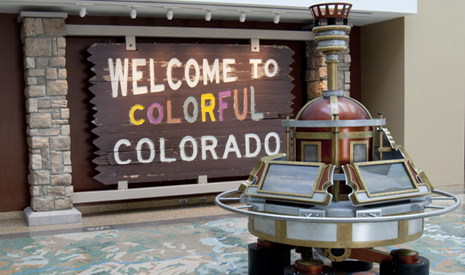 I overheard comments about the museum, different facets of exhibits, and praise for inventive ways to experience aspects of Colorado history. One woman rode the Steamboat Springs make-believe ski jump and said she crashed. Write an article on injuries from ski jumping, famous ski jumpers from Colorado, and the art of ski jumping. Many videos added ideas to my list – mining accidents, living daily in the mines, the use of dynamite, shopping for groceries or cooking in the 1800s, the costs of things, people and places, and even every day chores before modern conveniences. How was bathing different from today? How did people keep from smelling when only bathing once a week? Mining added arsenic to lakes and rivers. How could one determine if the water were polluted? Gather popular recipes from the 1800s. Write about canning and manufactured canned goods. How did buckskin, buffalo blankets, or other animal skins used for clothing feel? I rode the ski jump and felt the wind in my face, the bumps of the packed snow on the slide, and the jolt of landing. My legs felt wobbly for a few minutes after finishing the ride. How do skiers overcome the exertion of the ride? When it is time to write, collect your ideas, research, and give your article a catchy title. Be alert for ideas everywhere and increase your output. How do you gather article ideas? My phone is old and I can't do those things. I carry a notebook but didn't take it out for this trip. thanks for your comments. I've fnally started writting down some of my better ideas (at least to me). Though the list is growing long (which means I'm not writing on them yet) I enjoy the possibilities I've set before me. Another great way to set writing goals. Thanks, Dean, for posting on Facebook. Keep that list going. Put it in a place you'll remember. I make notes and then lose them! You are so right that inspiration for articles and blog posts is everywhere! I'm always jotting down notes on paper, on my laptop, in my phone... I send emails to myself with interesting links. I take photos with my phone. For sources of inspiration, I like to expose myself to variety. I read narrative non-fiction from the library on topics I'd never considered before, I LOVE magazines of all types, I read blog posts, I visit Pinterest, I listen to NPR, I go to church. Thanks, Stephanie. We are in Sun Valley, ID for a Dixieland Jazz festival and I'll keep my notebook handy!